Bangalore has got the Tag of a "Garbage city" recently due to gross mismanagement of Garbage collection and disposal. The city’s failure to manage its garbage is reducing vast stretches of its hinterland into wasteland. The crisis is so acute that dozens of students of a school at Mandur [1a], near Hosure [1b] [Hosekote ? ], off Old Madras Road, are leaving the institution, unable to bear the pollution threat posed by the garbage dumped in a landfill nearby. Mandur site, [1c] which is about 30km from Bangalore, is the only active landfill. The other two — at Mavallipura and near Dodda-Ballapur — were shut down following protests from the local residents. Over 600 tones of garbage sent to the Mandur landfill daily has created hillocks of waste on a 25-acre of government land. The garbage is not processed. Consequently, air and ground water pollution, mosquito menace and roving bands of stray dogs have made life miserable in the surroundings. Terra firma 1000 tons capacity closed on August 20 following protests by locals. Unfortunately Minister Ashok nor BBMP are aware of any fundamental facts or principles. of the issue. Earlier praja discussions are relevant here. Land fill - Bury the kitchen waste with the plastic bag in which it is dumped. But the locations are wrong!! I have relesed Rs 5Cr/- enjoy! Very distressing coverage indeed on the National TV about our garbage city! In recent weeks, a wholly needless crisis in managing garbage seems to have been created due to the systemic failure of the Bruhat Bengaluru Mahanagara Palike and other agencies. It is claimed that the action of the Karnataka State Pollution Control Board forcing closure of the landfill operated by M/s Ramky at Mavallipura has provided no option to the city but to landfill wherever possible. By so stating, there are attempts to project the legally correct regulatory action of KSPCB as being against the public interest, when the fact is Ramky has been operating the landfill without any legal clearance and in criminal disregard of applicable standards, norms and laws. It is well known that villages around Bangalore have become victim to the massive and largely illegal dumping of about 5,000 tonnes of solid waste generated daily in the city. For years now they have quietly endured the obnoxious impact of Bangalore's callousness. Several villagers have died as a direct consequence of such dumping of toxic waste, and many more are suffering a wide range of infectious and chronic illnesses. This abhorrent practice of dumping waste has destroyed village commons, farming land, grazing pastures, forests and water sources, and adversely impacted thousands of livelihoods. The pollutants released have contaminated lakes, wells, streams, the air, etc., and is finding its way back into Bangalore's population through food chains. If villagers across Bangalore are justly standing up for their Fundamental Right to a Clean Environment, can BBMP force them to accept the waste under the threat of police action? The Mayor and Commissioner point to every street corner overflowing with garbage as an indication of a crisis. What is not being shared is that this is a direct consequence of BBMPs inaction over years. Waste is not being picked up for a week now and in a totally unwarranted reaction, waste piles are being set afire spreading highly carcinogenic toxic air in residential areas. All this is in total disregard of Supreme Court mandated guidelines on solid waste management. The decade old guidelines categorically direct cities to segregate waste at source, and approve of landfilling only upto 15% of the waste generated constituting of inerts (rejects). Clearly, therefore, landfilling all waste is illegal. Taking opportunity of this systemic failure of BBMP, some entrepreneurs are aggressively promoting Waste to Energy (WTE) projects claiming this as a solution to address 'waste' problem once and for all. Nothing could be farther from the truth. The Supreme court guidelines clearly lay down that WTE, like RDF or pyrolosis, can only be an option to process residual matter which can neither be composted or recycled (more as an exception). If WTE involves adopting bio-methanation or co-processing (burning waste in cement kilns) then the fundamental requirement for both these processes to work demands segregation at source. Since BBMP has comprehensively failed to promote segregation at source, it is wrong to promise residents that WTE will solve Bangalore's garbage problems. What the city needs now is the willingness to immediately implement various short and long term measures, as quickly and opportunistically as BBMP is considering a hike in solid waste management cess. Bulk generators who contribute to 40% of the city waste must be made to start segregation and composting on site right away. If they fail to, criminal action must be initiated against them. The new Door to Door contract which makes handing over of segregated waste mandatory must be streamlined, made effective and free of all corrupt and inhuman practices. BBMP and Bangalore's residents must work together to humanely integrate waste-pickers in decentralised management of solid waste as an essential and sustainable prerequisite of such municipal services. BBMP must immediately make public its policy on Integrated Solid Waste Management and begin to comprehensively implement various measures outlined to deal with the garbage problem. Such approaches will ensure compliance with the Supreme Court Guidelines and provide a lasting approach to dealing with the garbage problem, which will only increase with population. These measures will also help us steer towards positive solutions and out of a crisis mentality that the BBMP seems to be chronically suffering from; a situation that is being taken advantage of by various vested interests. The fact is that much of what Bangalore now produces as “waste” is rich in organic matter that can easily be composted at source to make manure to grow gardens. The methods are easy to adopt and there are several organisations who have provided innovative solutions for various situations: houses, apartments, in offices, schools, public institutions, factories, etc. In simple terms, if we segregate what we think now as 'waste' at source, not only will it help in reducing waste and bring it to manageable levels, but more importantly it will throw up options for the 'waste' to be dealt with in a resourceful way. This will contribute to huge savings in the current practice of transporting 'waste' out (60% of Rs. 450 crores annually for solid waste management is the trucking cost alone), but would completely prevent the need to dump waste in massive landfills – legal and illegal. Such practices, in any case, are environmentally unfriendly, contribute to climate change, adversely affect public health and are wholly unjust: for they cause havoc to the lives and livelihoods of villages surrounding Bangalore whose communities have generated none of that. For a city that prides itself of being on the forefront of advancement in science and technology, it would be a shame to create a crisis out of garbage management. Keeping all this in view, the undersigned organisations appeal to the authorities to convert what they now consider as a 'crisis' in garbage management, into what it truly is, an opportunity to transform Bangalore into a city that makes value out of 'waste'. Each of the undersigned organisations are voluntary and not-for-profit initiatives and work with public interest as their main and only focus. We are willing to assist the Mayor, Commissioner, Corporators, MLAs and all others involved in BBMP in making this transition progressive, environmentally intelligent, socially just and an economical prudent approach. I feel every citizen needs to join in the effort to move along the above lines. Waste to Energy (WTE) is the best option available now. Recycling technologies available now are not good enough for making products that can be sold and even safe. Even if the waste is very carefully segregated the quality of final recycled products will be unpredictable. This will be the case atleast with plastics. There are so many components to plastic products with many options in those components like additives, dyes etc. as everyone knows, and they will change to unpredictable products during recyling. For ecample if we take polyethylene, there will be different manufactureres who have added different components for different reasons. Recycling will come into conflict with safety issues in the end. Therefore only option left is WTE. The condition need to be imposed is they should not pollute air instead of the earth, water etc. even if the costs cannot be covered by selling energy, and those companies ask for a fee. That is the waste should be burned in very high temperature so that all waste is degraded to simple and safe chemicals. Segragation of course will be beneficial to design a more efficient and nonpolluting WTE process. Again it will release CO2 etc., but that can only be reduced by reducing consumption. ..there is a way, not blaming system(though they have right to do so as tax payers) ! Check this out... and check out whole website..
Bheema blaming the government is not the end in itself. I agree. Our governor recently made a Naïve statement “give me 20 people and I will get the city cleaned” which attracted some caustic remarks by the BJP spokes person. Keeping the city clean is one of the responsibilities of BBMP. The daily dump site is a good reference provided by you, which says that the process of keeping our city clean starts with each house hold. However BBMP has to make it happen. It is our responsibility to talk to them and convince them to collect each segregated garbage on seperate days . Praja and other like minded NGO’s should set up a dialogue with Minister Ashok along with BBMP officials. Organic waste to manure / plastic recycling / WTE are worth considering A joint action by Praja and all other NGOs concerned is necessary to make BBMP to comply. After the recent garbage crisis, to day I was surprised to see Mr. Vijay Kumar, the Corporater Sumitra Vijay Kumar’s husband, with his cronies doing the rounds of our ward. As usual his crony came to my place to call me out. Several residents had allready gathered as usual. There was a lot of activity with the 3 wheeler vehicle being loaded with garbage. The residents wanted their plastic bags with day’s garbage collected at their main door. BBMP and other officials including the health Inspector were around. My plea about segregation at source fell on deaf ears as expected. Environment Support Group ESG report is available in their web site.
" It takes simple sensitivity on the part of every family and business in Bangalore to prevent people in villages surrounding from dying due to the waste that is now dumped on them. If everyone segregated waste at source ensuring recyclable plastics, bottles and metals were given to a local raddiwala (for a small gain, or free even, so they may not have to scavenge it out of dustbins) and composted organic matter at home (household refuse is mostly organic), 60% of the waste generated in Bangalore would not exist then. " Few weeks back I met this lady. Lot of positive enery. Check this out. Let her tribe grow. Home minister labels a composting unit set up in Jayanagar in January a flop, much to the anger of local leaders. A check found the facility fully functional and working perfectly. The piles of garbage lining important roads in the city appear to have given home minister R Ashoka a bad bout of foot-in-mouth disease. In comments made to Bangalore Mirror on Monday, Ashoka had ridiculed efforts of political leaders of the Jayanagar constituency to reduce waste in the area. This is perhaps the best thing that can happen to Bangalore. Outgoing commissioner MK Shankarlinge Gowda has left BBMP with a waste management solution. The new garbage tenders will have a clause that makes it mandatory to pick up waste only if it is segregated. However, the new tenders are yet to be floated. Take, for instance, the gargantuan garbage crisis in Bangalore which is generating widespread dengue panic. Trash is piling up on street corners, uncollected and unprocessed, because the landfills are overflowing, creating a health crisis in nearby villages outside the city. Their refusal to pay the price for our excesses is the immediate cause for the current state of affairs. Who is to blame? The BBMP, governments past and present, the garbage mafia et al. But also we Bangaloreans who blithely ignore the consequences of our urban lifestyle as long as our waste is being shipped elsewhere, it’s always someone else’s problem — like the residents of Mandur where indiscriminate dumping has poisoned the ground water, destroyed farming land, created an unlivable stench and out-of-control mosquito infestation. The villagers now suffer from chronic skin conditions, respiratory problems, and constant diarrhea. We are more concerned about the soluition of the problem, not about how much or for whome etc. Wheter the problem is for the city or the villages, is besides the point. I am sure we all understand. The out going commisioner has alredy shown the way. He has been shown the door! What a shame! No ferrying to long distances outside city at all. Infact zero daily ferrying ! Be prepared to the objections by the lorry loby who will loose major share of the pie. What is the Tamasha going on? The garbage of a tpye has to collect each day without mixing. The green garbage should be composted at the ward park. An exclusive small [corner] area should be earmarked for this. It wont take more space as I can see it. Plastic and electronic waste is to be recycled to the extent possible. Remaining waste can be used for generating usefull energy. There is no high price but high gain !!! Let us stop crying. Start laughing instead! Even after segregation at source we will still be left with solid waste that needs to be disposed off. Land filings are one way of disposing solid waste. For a proper disposal at land fills, waste should not be dumped and left open. This will certainly create health hazards and environmental problems. In places like Los Vegas (USA), solid waste is carried over to a vast spaces of land fills and is dumped and spread evenly. Then a road roller is run to compact it further. After which a layer of mud is added on top of it and grass seeds are sprinkled all over it. For next few days the whole area is watered. Within couple of weeks whole area would be flush with green grass. This way the waste is not left open and exposed for birds/vultures to feed on and mosquito to breed. Certainly this a better way of disposing the solid waste. This will certainly make the solution complete that starts with segregation at the source. You are right Sayed Ji. Segregation is the first step. However, it is not the solution in itself. Present day Garbage needs to be managed. Not disposed. The existence of rag pickers shows that there are some items of value in garbage. Wet / green Garbage is best for comosting. My earlier blog on Bangala Desi camp is relevant here. Please click here. Burying plastics / electronic items is environmental unfriendly. Hence should be prohibited. Instead they need to be recycled. Kolkata went ahead and reclaimed a garbage dump and turned it into the Science City ..thought this was a prudent move and beneficial to public too..
Now vilagers in case of blr are complaining of the dump bringing down the prices of land in the surrounding areas..but some planning and assurances on when the reclamation will be done will probably help public.. I searched the Science city web site. where has it said that it was built on a garbage dump site? More important to know is, how Kolkata mangled its garbage so that the dump area could be reclaimed? While dump yard brings down the value of the neighboring land, reverse is true when there is no dumping. Alert people can buy land around the current dump yards in Bangalore at throwaway prices. The fact is that Garbage can be managed better, requiring zero dumping! on the news that science city was built on a garbage dump..here is a link which has a mention..
search for 'dumping' in the document..you will see! Back in 97' when the building was inagurated..there was loads of mention about the reclamation! also High Court has stated that if the objective of genertaing power or wealth out of waste is adopted, then the requirement of landfills may not occur,which is also very correct; in fact I had seen an article in DECCAN HERALD as to how in Sweden, they address the problem of garbage management in an organised & scientific way, that it has ceased to be a problem at all. I would like to add that the aspect & benefits of segregation of waste into bio-degradable waste and the rest should be advertised on TV's on prime time, taught in schools & advertised through displays on giant hoardings, until it becomes an accepted practice. Further Praja members in their own localities can plan to visit each & every individual houshold and impress & educate them about waste segregation and other aspects and generation of wealth or power from garbage, so that the requirement of landfills will not occur. In addition, this garbage management should be implemented throughout Karnataka & India. To day I saw these expensive milch cows feasting at Domlur CGHS road next to the old Madras road Indiranagar Fly over. These unauthorized eyesore garbage dumps though diminished are yet to be eliminated. 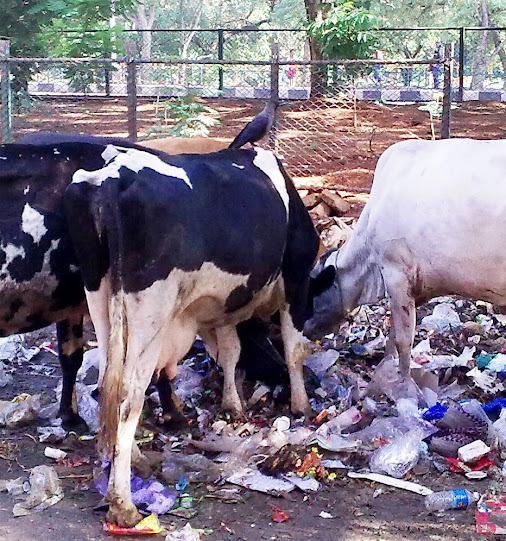 Plastic if gulped will be a serious threat to the life of these expensive cows. Finally BBMP has opened its solid waste management to Facebook. Its official, as this link is posted in BBMP homepage as well. Certainly a welcome move by BBMP. I thank people behind, though we dont know who. The new BBMP commissioner Dr.AS Rajanish Goel has worked really fast. Thanks Bheema for the link. His work will lead to zero or minimum land fills. Think of the daily wastage of diesel for tansportation of Bangalore waste to the outsirt of the city. However there is a further step of segrigation of reusable waste. Recycling of different kind of plastics can be done in the city itself. There are recycling plants in the city which are in brink of extingsion due to pucity of work. For more details clik here. The BBMP may penalise people for spitting, urinating and defecating in public places, with a fine of Rs 100. The schedule also mentions a penalty of Rs 500 for “not disposing of (non-household) fish, poultry and meat waste in the segregated manner as specified.” Besides, pet owners will be fined Rs 50 every time their pets relieve on roads. Sounds good on paper - hope BBMP seriously sets up a squad of hounds to catch the culprits in the act & fine them. my garbage sorted and how? GC: Sir, they(BBMP) are bringing some new rule abt sorting garbage..please dont sort! me: why? isnt that supposed to help? GC: they plan to take all the plastics once a week and sell it and give us 10-20rs per week...but as of now I alone make 100 Rs a week sorting it myself..so dont sort! But I still plan to sort it for him though..
@Srinidhi Yes, true. I have been sorting dry waste and giving to GC for last one year. Also I started to give old paper/ cleaned nandini saches to GC. But I have stopped giving "Mane Hana"(monthly tip). From TOI -BBMP council took a decision to keep one NGO 'Shuchi Mitra' out of BBMPs solid waste management activities. BBMP had in the garbage tenders floated last week mandated that contractors would have to obtain 'No objection certificate' from 'Shuchi Mitras'. The civic volunteers were to act as watchdogs to monitor proper segregation of waste by households and ensure that only segregated waste was picked up by pourakarmikas. On one side, we advocate for ward level commites, ward-sabhas, and active involvement of residents and RWAs in civic works, and here our representatives want to keep these volunteers out. Did anyone see TV9 last evening? There wa a discussion on garbage issue where KSPCB, BBMP and Dr. Meenakshi Bharath were present. The new chairman of KSPCB Dr. Vaman Acharya was straight and point blank. He explained the real meaning of scientific disposal of garbage. People who generally talk abt scientific disposal, dont know the process, but still use that jargon just for talking. Dr. Acharya appears to be down to earth and pro active. Meenakshi Bharath cannot talk beyond sorting dry and wet waste at residential level. The wannabe politico she is. Either she needs to discuss properly or keep away. BBMP reps were unable to explain the huge cost and the control of the garbage disposal by a few. So much for the garden city. Who is going to segregate this? A massive party by local vandalists (I call them so). Generated lot if waste in public place. All types of waste, you can see in video. Who is to going to segregate this? Check this lengthy video of 9 mins. There is an article in today's DH regarding garbage mafia sabotaging reforms. As if this is a surprise. Yesterday afternoon I was driving in Malleswaram. Piles of garbage on 8th main rd and also in 15th cross near the dhobi ghat. Not sure who got them there or when it would be lifted. This segregation is the best move by the city so far, both BBMP & skeptical citizens had to be dragged kicking & screaming into the next century. Everybody will learn along the way & perfect the methodology. I can see BBMP learning. 1st few days they didnt care, today they were looking into the plastic & refusing to take unsorted trash. Having taken the first step towards segregation I realize 98% of my waste is dry waste. Have setup a composting pit in the backyard where the small amount of wet waste is being composted. It tells me 2 things. One I wouldnt have known the nature of my garbage if it wasnt for this imposition of segregation on me. Two almost all of the dry waste is food & other consumer goods packaging. Let me just say, its one thing to know what is good & what is bad but none of us will do the inconvinient right things till a gun is put on our heads. Am still waiting for the day when parking fees & private transport disincentives will see the light of day. Inconvinient but the right things to do. Can we make the horse drink ? Also, public spitting /urinating /littering /defecating must be dealt with an iron hand. Disgusting to see people getting off cars & urinating on the road side (eg. Dickenson rd parking near commercial st). Having used for facebook for more than 2 yrs, many are addicted to "like" button. So suggestion is to have a "like" button even for comments. Many comments are so good and valuable :) Even "agree/disagree" buttons would kick nice "campaign" ! A nice video there Bheema! Bheema, I feel that the video needs major editing to make it more interesting. On my first try I wandered away. I returned and forced myself to view it in detail. Probably a few specific pictures carefully selected would be more effective. Do you propose / already discussed with them? It is a common practice that servants are made to dispose wet garbage in plastic bags unobtrusively on the roads after house hold work. I have seen such blatant cases during my morning walks. The people responcible ofcource should be fined. Dickenson road parking near commercial street needs video camera to be installed. A few in a month being punished will deter others. The simple presence of a working camera itself would perhaps act as a deterent. Are there no Corporation Washing Clossets near by? I think there is one which stinks due to poor maintenance. Intentionally I have not given that info. Idea was just to give a illustration. I am not planning to edit it either. The basic question remains same: Who is going to segregate the waste generated at public place? Obviously BBMP is not to segregate garbage at public or private places. It is not their job any more. It should not do it either. It is a well established scientific fact that garbage segregated at source is the optimum. Governament should promulgate laws making persons responsible for public nuisance punishable. 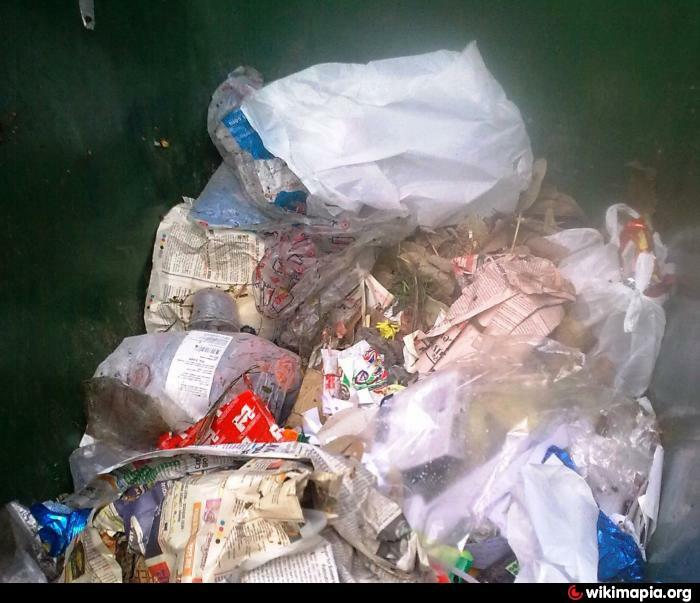 Garbage at public places is being transported to landfills as of now without any segregation. However these reforms are affecting the Lorry owner lobbies who have invested a lot of money on their special vehicles. They stand to loose. Hence the present turmoil. do we really think there can be 100% segregation?In a place like bangalore? if not , what then? is it that non segregated garbage is not picked up?what happens then? Or do we expect ," ragpickers " to do this?A profession that should be banned like manual scavenging!! why aren't we activcely debating , pursuing WTE options?i wonder. No they can be employed by BBMP. 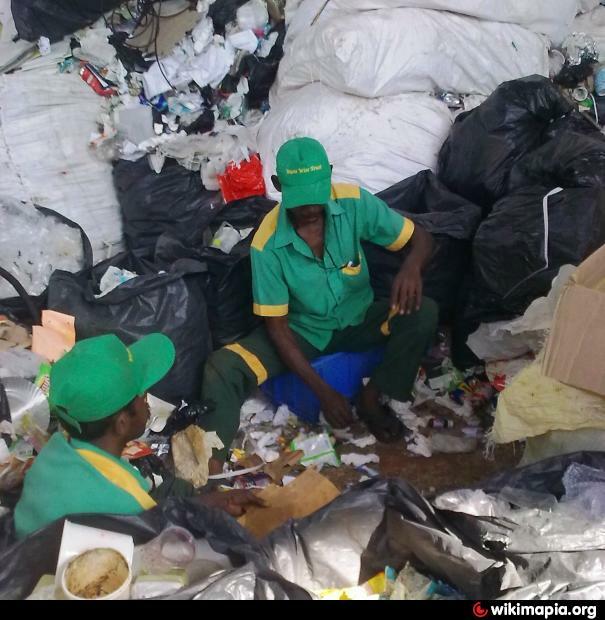 If I am not wrong Waste Wise Trust employed these very same rag pickers, gave those uniforms. They are doing exemplary work. WTE - all hot air? At a seminar on 'Solid waste management, a perspective towards cleaner city', organized by the state government here on Tuesday, she (Almitra H Patel) said: "No waste-to-energy plant in India has worked successfully so far. Foreign technologies cannot blindly be made to work here. Waste in foreign countries will not have much wet and organic component (16%-24 %) and organic component like that of India (60%-80 %). There is no surplus energy in this matter." Patel pointed out that municipal solid waste cannot even be incinerated as per a 2004 SAARC regulation. "Many companies which started waste-to-energy plants in different Indian cities ran away with bank loans, leaving projects incomplete. Don't mix waste is my thumb rule. Dry waste can be recycled and wet waste turned into biogas or composted for use in parks and green spaces on medians," she said. Ms Patel is a studied person, and one can expect she knows what she is talking. So, where do we go from here? Almitra Patel is no doubt an expert on the subject. Her views on Waste to energy may be reliable. However I am afraid that they are not relevant to the discussions here. The rag pickers are professional people. They collect huge amount of plastic waste daily which is remunerative. Obviously, they would not be doing the daily rounds otherwise. For earlier praja discussions on the subject click here  and here . Her discussion is not on the relevance of seggregation.Everyone agrees that seggregation is important. As far as I understand, her questions are about the next steps after seggregation. For example, people are already discussing composting/ biogas generators to take care of the wet waste generated in apartment complexes. According to me, unless this is planned during the apartment construction phase, it is difficult to incorporate later. Many apartment complexex in Bangalore do not have the free space for composting, and biogas plants would be expensive. So, unless biogas generators can show some advantages, in terms of enviroment pollution etc, maybe we should not push people to do it right now. We already had the BBMP environment engineer, suggesting installing biogas plants in the apartment complex. Another question related to garbage management : It seems BBMP is currently collecting a Garbage cess from every household. Right now, my apartment send only the wet waste to BBMP, and send the dry waste etc to an NGO. Now, if they charge for wet waste colelction, (Rs 1/- per kg? ) is that double charging? There is a move to make BBMP collect Apartment garbage too, I believe. BBMP should agree to this. New apartments should however need to comply with new rules if at all made after public consultations. Mayflower a Shobha Apartment on outer ring road recycles toilet flushing water in their STP [Sewage Treatment Plant ]. 34% of Bangalore is already segregating, this is a good sign, as per this article, a lot of people are still doing nothing but expecting somebody to take care of their mess. I think from citizens side we have a long way to go to make this 100%. 100% segregation will not be achieved by waving a wand. Exceptions will need to be handled. However long it takes we have to keep at it & work towards making it a habit. Very relevant questions on the next step & also unanswered questions on apartments etc, we need to have the experts help BBMP in going forwrd. Come out with a solution (however good or bad they might seem) for those questions & maybe we can suggest them to BBMP. But we should never go back to unsorted garbage just because we cant figure out how to handle it. Unsorted garbage is just the same garbage but seperated, so it cant be unhandelable. The media quotes in the above comments from knowledgable people should serve as good best practise debating points. BBMP should try them all out, till the best way is found. Not trying a new thing will yeild the same results we always got. Unfortunately is BDA in a bad shape these days?
" After transferring Bharat Lal Meena, the government appointed Pradeep Singh Kharola as the BDA commissioner. But even before Kharola could get accustomed to his new role, he was moved as the principal secretary to the chief minister, leaving the civic agency headless. " For the full City plus News week article of September 22, 2012 Click here. While searching "Domlur corporater" I chanced to see a shocking, more than a year old, TOI article. Click here For it ! Can WTE be worth trying at all? This article is from Matt Hickman an Eco living expert and a prolific blogger. For more about Matt Hickman click here. I tried to epitomize this article by Prof Aswin Mahesh, but failed misarably . Here is the full article cleaned up a bit. For the original TOI article Click here. “Why is it so hard to fix the garbage problem? There are many answers, but one stands out: most BBMP data is either not reliable, or almost certainly fudged. The solution, therefore, is within the problem. Make data public, and let policy be driven by it, with a clear focus on reducing waste sent to landfills. It’s important to understand that the current system runs entirely on bad data, and deliberately so. Consider a few things, all easily verifiable. BBMP says close to 5,000 tonnes of garbage are generated daily. But no one has seen a breakdown of this number. All calculations by solid waste management activists suggest this number is an over-estimate, and the actual figure is closer to 3,500 tonnes. But since contractors are paid by the tonnes, there's very little incentive to document the correct figure. Moreover, recent successes from recycling communities suggest that 1,200 tonnes of the 3,500 tonnes can be diverted from landfills and brought back into use immediately. But the contracting system resists this — for the same reason. Did you know that BBMP has burned Rs 200 crore in the last 8-10 weeks - Rs 2.5 crore per week per zone approximately — on a temporary, exigency arrangement to lift trash. The bottom line continues to be: BBMP wants a transport contract, and as long as this prevails, the city will continue to stink. We have to move to landfill avoidance and incentives for that. The same Rs 200 Crore could have created the entire sorting infrastructure we need throughout the city. No prizes for guessing why this isn’t done. The obfuscation is everywhere. The tracking system for garbage trucks was launched with great fanfare a couple of years ago. A new system for documenting actual lifting of trash at secondary collection centers was launched in South Zone a few weeks ago. Despite several requests to open up the system so that citizens can track the work of contractors, BBMP hasn’t done this. Everyone can see the solution — we need a recycle focused system that rewards residents for generating less waste, instead of the current land filling system that rewards contractors for hauling more waste, including fictitious stuff. this can be a far fetched idea which can be considered, so that we can earn money and reduce our waste management problem. The above two(Root Cause Analysis & Pareto Analysis) are from TQM (Total Quality Management). May be it would help. I am sure most of Prajas and BBMP officials know it very well. If there is (political) will there are many ways ! Each of issue can be take as and "effect" and analysis can be made for "cause". We all know "cause" will invariably boil down as "corruption","politics","no ethics","bad culture" or "religion". But yet, we can have analysis just one/two level above. What say? Effect : Why people do not segregate? While I do my homework on this, is there anyone else wants to jump in? No prizes for guessing why Bangalore is stinking! Bheema, very interesting info on root cause and Pareto analysis there! It is indeed a good contribution to the discussions here. However you may agree that the final result sought is not segregation per say but efficient garbage management “we the people” generate. Further think when people do segregate but BBMP manages to mix it back! If one reads the article by Prof Ashwin Mahesh which appeared in TOI, BBMP’s real motive behind all this is very clear. ARTI has developed a compact biogas plant which uses waste food rather than dung/manure as feedstock, to supply biogas for cooking. The plant is sufficiently compact to be used by urban households, and about 2000 are currently in use – both in urban and rural households in Maharashtra. A few have been installed in other parts of India and even elsewhere in the world. The design and development of this simple, yet powerful technology for the people, has won ARTI the Ashden Award for Sustainable Energy 2006 in the Food Security category. This makes ARTI the only organization in the world to win the prestigious Ashden Award twice. ARTI won its first Ashden Award in 2002 for its chain of technologies for converting agricultural waste into charcoal, and using this as a clean domestic fuel. Bangalore can do with such plants in every locality! “The Karnataka High Court on Friday pulled up the BBMP for failing to resolve Bangalore’s garbage woes. This is the second rap that the civic body has received in 20 days. “Who is asking you to save money? Save the city,’’ a division bench headed by chief justice Vikramajit Sen said when BBMP commissioner Rajneesh Goel mentioned that the new garbage tender proposals would entail a saving of about Rs 200 crore a year. The court directed the commissioner to file a status report by November 5. The court held out a stringent warning: it would not hesitate to supersede the BBMP council if it found Corporaters interfering in the tendering process. “People are running out of patience,’’ the chief justice observed. SG Srinath #49 7th main 7th E cross Rajiv Nagar BSK 3rd Stage Padmanabha Nagar. Food items like banana peals, Vegetable shavings and food leftovers are the raw materials. About 500gr of this supports about half an hour cooking. A small unit can be accommodated in a balcony of a flat. As the unit emits smell it is not recommended for installation inside the house. Total cost is around 10 to 15 K Rs. Ideal for Apartments and Other households with some space to accomodate the equipment..
ARTI in cities Gobar gas in villages. Waste Accounting in Sweden is something like:- Plastics, Recycled (39%), Bio degradable, Energy recovered (60%) and Others for Land Fill (1%). For the full article click here. The ’Others’ category though very small needs to be accounted too. With regard to this, I came across a news item in DH where the HC (none othar than the Chief Justice himself) has reprimanded BDA for its failure in Garbage Disposal while hearing some petitions filed by RWA's or probably citiizens. The following suggestions of mine can be included in our petitions; I am 100% sure that anyone can check up to confirm that most of my suggestions would be practised in Sweden and other places where garbage disposal is not an issue or problem. In June 2008, KNN gave a BOOT (build, own, operate, transfer) contract for processing and disposing of solid waste to A2Z Infrastructure, a private company, which was selected through a process of competitive bidding. 2) Door-to-door collection of garbage is being done in bins attached to rickshaws by safai mitras using hand gloves and protective masks. The garbage is directly unloaded into refuse compactor trucks of varying capacity, which can typically take the load of 40 to 50 bins. 7) The garbage is taken to a central site where it is sorted, segregated, transformed into a number of products of value, for example, premium quality compost, RDF, interlocking tiles from construction debris for use in footpath paving, etc. After selling off some other recyclable material, very little (less than 2 per cent or so) remains to be deposited in the landfill. The landfill, which was expected to fill up in seven years, may actually take much longer, thanks to the success in reusing most of the waste. 8) Kanpur Waste Management Plant is the largest producer of compost from organic waste; about 50 per cent of the waste collected from Kanpur is biodegradable. 9) The quality of the compost is enhanced by scientific inputs coming from the R&D lab at the plant. The premium quality organic fertiliser is sold through fertiliser marketing companies like KRIBHCO, IPL, Coromandel, Green Star, and also directly under their own brand “Vasundhara”. 10) The plant is not able to meet the growing demand for organic fertiliser thanks to the Fertiliser Control Order of 2010, which has defined the specifications of the compost made from organic sources, including food components and the scarcity of quality compost in the country. PS: A letter was sent to the CM, Mayor, and others by a Mr Dinkar Rao on the above basis on 2nd Nov.
Now, this is almost a full-scale contract given to a professional contractor, with there being no segregation at source. The success has perhaps been due to professionalism in the detailing of the works involved, drawing up of the terms and conditions, selection of contractors, and monitoring of the actual working - essentially a "corporatisation" of the entire process. In Namma Bengaluru, on the other hand, the entire job is controlled by the "garbage transport contractor lobby", some amongst whom possibly are city Corporators (or their nominees) even. When things started going bad (as only to be expected), somewhere along, a Corporate (Ramky) was brought into the picture, more for show than for actual professionalising of the work, since many links in the whole chain remained loose, if not untied. Eventually, perhaps Ramki also chose to play ball with the powers that be, the whole thing ending up in the mess we have now. Even with Kanpur being closer to Wasseypur, apparently our garbage transport contractor lobby is a lot more powerful than their's. Still the segragation cannot be abandoned. Before putting the waste in garbage bin it is actually clean and easy to handle. It is very difficult to handle the waste when say waste food products and plastics get mixxed. People are not doing it because of convenience and ego. But that cannot be an excuse. In daily jobs we cannot even misplace a zero! segragation is a necessity and there cannot be an excuse. After the waste is mixed together, it cannot be separated. Even if the contractors have too much power over their employees it will not happen. Those who are employed for segragation may say we will do it but never will be done perfectly. Like vmenon said in another post, rag pickers have no role in civilized society, means better jobs should be available to them. Wte will have problems like in handling dioxins produced when burning waste. Regarding, the contractors being against composting, if the contract is for satisfaction of the citizens rather than the weight of the garbage collected, this could be solved. If they get the same, money even when waste is segragated they may not have problem. In future contracts the clauses could be changed. In future, all costs involved in handling waste, like cost of land fills, environmental degradation, and we can have better agreements with contractors. Convenience and ego are no longer valid excuses. We have passed that stage. In fact we are at an emergent situation of spreading of diseases like Dengue. Segregation at house hold level is the solution and BBMP has rightly promulgated the order. The order has to be implemented pronto as the rats, snakes and Dengue is staring at us. Revamping of contract clauses is a must. For an earlier comment on this Click here. For todays Bangalore Mirror article click here. The BBMP is setting up a bio-gas plant in Yediyur ward that can process 50 tonnes of wet waste and is planning to generate 1MW power by roping in a power firm. The move will also save the civic agencies Rs 1.25 lakh on power bills. The BBMP on Monday kicked off a project for setting up the plant in the ward, which falls under the Padmanabha nagar assembly constituency, home constituency of deputy chief minister R Ashoka. The eight wards in the constituency altogether generate 21 tonnes of garbage every day. The plant will come up on a 10,000 sq ft area plot near the garbage segregation centre near Nanda Theatre in Jayanagar 3rd Block. Ramesh said since the BBMP does not have the facility to convert bio-gas into electricity, it will float tenders an drop in companies to do the job. “After setting up the bio gas plant, interested agencies will be assigned the task of producing power from the gas. For the Bangalore Mirror article click here. If your layout has a vacant civic amenity (CA) site.. This is how the news article in TOI today starts..it further reads..
..and you hoped to see a garden or play area for children, you may be disappointed. 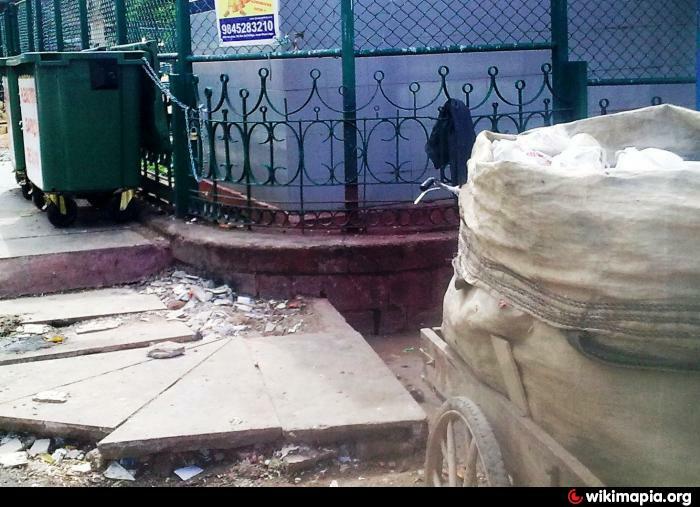 For, you may see a garbage collection and segregation point right there. What is the interesting part in the whole article is the starting word 'If' . That question should never have been there. If we go by the actual regulations for formation of layouts and housing facilities, the rule book stipulates minimum space to be reserved for CA sites for certain number/size of sites(dwelling area). Unfortunately this is never followed..which has contributed to a mess..
BDA needs to be questioned on this because they are wholy and solely responsible for the mess we have now currently in! The Ministry of Environment and Forests has notified the Municipal Solid Wastes (Management and Handling) Rules in 2002. These lay down the procedures/guidelines for collection, segregation, storage, transportation, processing, and disposal of municipal solid waste. The rules require that all cities should set up suitable waste treatment and disposal facilities by 31 December 2001. The rules also specify standards for compost quality, leach ate control, and management and closure of landfill sites. BDA should take note of it now, better late than never. For the government notification, click here. Ever since the garbage problem raised its ugly head in the garden city, various solutions are being offered by experts. If something goes wrong at any stage, it causes problems. When villagers protested against the unscientific dumping, the pollution control board closed down one of them. This led to the present crisis. The immediate reaction of the authorities was to find alternate landfill sites, which was not possible. With the change of guard at BBMP, the new commissioner prepared a new charter for dealing the garbage crisis. Segregation was made mandatory with penalties for non-compliance. However the preparatory time given was short. Also the forces working against it were so strong that it made little progress. Now there is an attempt to bring in new contractors who must operate with greater efficiency. Private firms are promising new technology solutions. What we are witnessing is ad hoc decision making and absence of long-term planning and effective coordination. At the heart of the problem is governance. The present governance system in BBMP is more prone to passing the buck than holding individuals accountable. In the absence of autonomy, the Mayor and the commissioner are forced to run to Vidhana Soudha whenever they run out of funds or want a major decision sanctioned. While the commissioner is the chief executive responsible for administration, the Standing Committee and the Council exercise higher sanctioning powers and can checkmate the proposals of the commissioner. Several extraneous forces too impede development. One way to improve efficiency is to create independent entities in the BBMP like a Solid Waste Management Authority or a Municipal Markets Management Authority run by professionals on corporate lines. It is time to reinvent the city government. We must have a city leader, directly elected by the people and accountable to them. He must be given tenure of 4-5 years and necessary powers to deliver goods with suitable checks and balances. If the government has no faith in local democracy, it must appoint an administrator with necessary powers to run the city and hold him responsible for results. This may not be possible under the present constitutional provisions but as most cities suffer from similar problems, this is an issue that must exercise both state and central governments. 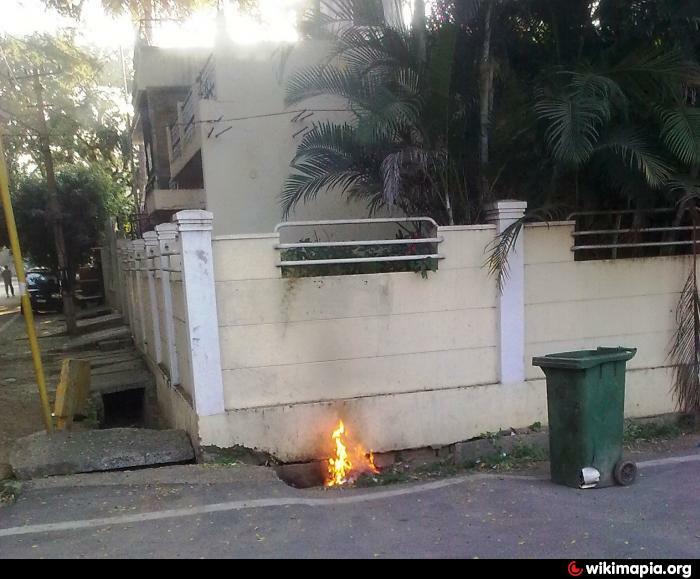 Picture 1 - an exmple of burning the tree leaves in a storm water drain. They are resorting to burning the waste as the new garbage contracters are yet to to go full swing. this method, can easily be replicated by our BBMP and why not in all other cities & towns. Just to give the link to the Deccan Herald article mensioned in your coomment above. It is a mini green revolution at this Malleshwaram hostel. Their garbage disposal model can well be replicated across the City, grappling with a crisis of gargantuan proportions. For the DH article click here. Yes segrigatiion is the main issue. In our locaiity BBMP has provided containers for dumpig garbage. People dump the garbage in plastic bags in to it. This defeats the whole concept of segrigation. Picture 2 This picture shows the Tricicle with plastic bags collected from the dustbin by the scavengers. Garbage Segregation is at source. If you see the picture above the two garbage bins provided by BBMP above are identical. People throw their garbage in plastic bags they carry it in and not emptying. What they should do is empty the wet kitchen garbage in a bin earmarked for that type, and all other [dry] into other bin. This is not so in the picture at the above comment by me! This shows clearly that the Corporation has no idea what they are doing. This is atrocious! Different color bins are required to assist the illeterate of cource. What is the relevence of being poor or rich Bheema? To days Bangalore mirror report has the round table event report. which reiterates the fact that segregation at source is the only solution possible. "preferably" is not acceptable. Trying to contact our Corporater to impress upon him this important point.